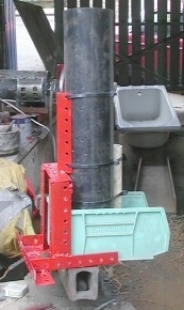 Media dispenser for suction blasters to improve grit feed. Built from Dexion shelving offcuts, a stench pipe, overflow pipe, and a Linbin. Three pipes are cut to length and bound together with solvent cement and cable ties. The stench pipe holds the grit and dispenses it through the cutout at the bottom end. Two narrow tubes serve as pickups for grit and air.